Take the time to read someone’s profile? Are you serious? Most profiles have barely anything on them. Why don’t you have an advanced search option allowing users to find people they have somthing in common with if you really claim its about getting to know people. Assuming all people who copy and paste an introductory message that they wrote themselves as a way to see who is interested are sleazy is insulting. Most women don’t reply because they have so many guys messaging them that they can choose from a list of men. Guys don’t have this option as men are expected to make the first move. Should a guy wait to receive a message from a woman who has a choice from men to pick from? The ones she shortlists will get the opportunity to have a conversation with her while the rest don’t even know if the woman is interested or not. It’s just much more easier to see who is interested by sending a copy and pasted message you have wrote rather than badger a woman on why she didn’t reply. “Update: So we’ve had two types of feedback on this feature. The vast majority has been super positive messages from people really happy to know what’s going on.” – You are bound to say that it’s your business. 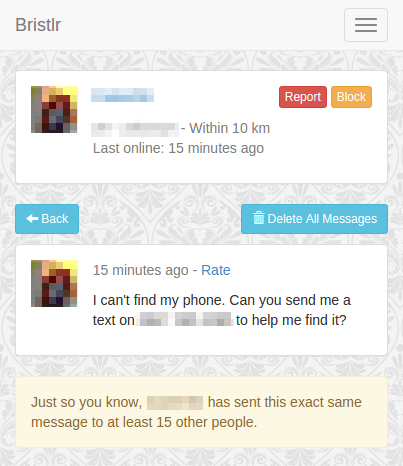 If it was about transparency you could have at least let users know that you have a copy and paste detector that lets users know if users messaging them have sent them a pasted message allowing them to see how many others that message has been sent to.